Friends and Neighbors is named after an obscure but exciting Ornette Coleman album, and they take the Coleman sound of energetic and melodic free jazz, developing a language that jumps out, with nods going back to traditional post bop as well as more revolutionary sounds. The band consists of André Roligheten on tenor saxophone and bass clarinet, Thomas Johansson on trumpet, Oscar Grönberg on piano, Jon Rune Strøm on bass and Tollef Østvang on drums. The music was recorded in Norway during February of 2018, and a track like "WLB" gives you a sense of what they are all about with a fierce and urgent thematic statement leading into the powerful front line of horn players pushing the music even further along as the rhythm section boils beneath them, settling in behind a soloing saxophonist and creating a strong dynamic flow. The music is raw and stripped of ornament, making for a very exciting improvised sound, that takes the classic Coleman model and updates it for the modern day. Pulsating trumpet engages with elastic sounding bass, taut piano and crisp drumming for a further encounter, one that adds further fuel to the fire of this excellent performance, with a choppy section of recapitulated theme leading to the fiery conclusion of the track. There is a softer and more textured approach to "Kubrick´s Rude" as the band employs multiple shades of hue and color in developing their opening melody, before gradually easing into an improvised section. The horns weave into each other dexterously and they rhythm team plays with subtle grace, giving the music air to breathe and develop organically and communicating very well together. The music gradually builds to a potent climax with all of the instruments pulling together to rise up as one before gently drifting away. "Mozart" has an interesting piano opening, into which the horns then bass and drums eventually glide join in a frictionless manner, creating a bouncy step as they go. A strong trumpet feature backed by mighty bass bounds forth playing fast and stark series of notes in an expansive and exciting manner, accompanied by some very fast and powerful drumming. The saxophonist calls for a halt with a quieter duet with the pianist, which is then given further context by the arrival of bass and drums, and the full band coalescing for a well articulated statement and send off. Finally, "Headway Heat" simmers with energy, dynamically pushing out into loud declarative statements and then falling back into sparkling individual improvisations such as the one for piano backed by wondrous bass and drums, before drifting back to a more languorous saxophone solo, one that shakes off its pallor and strides purposefully off into the future. 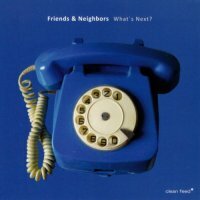 What's Next - Clean Feed Records.